Juneberry Lane: Bonus Tutorial: Chocolate Covered Oreos . . .
Cover almost anything sweet in chocolate (and even some things not so sweet . . .potato chip anyone?) and it is sure to be delicious. 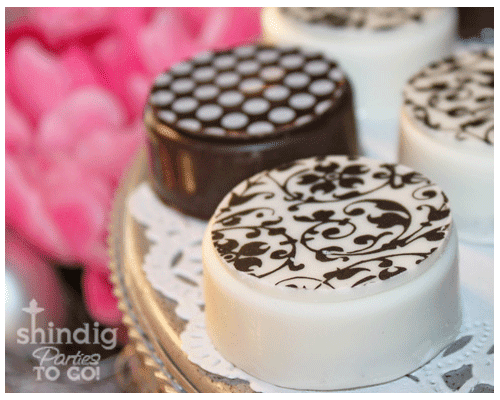 And these divine & delectable chocolate-covered Oreos are clearly no exception. As we head into the weekend, pop on into your kitchen and start creating. 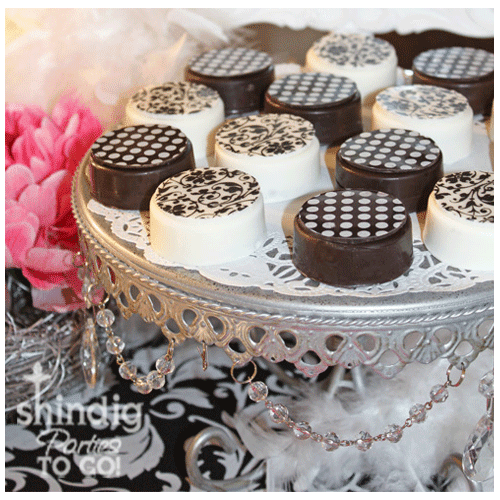 Best yet, you can customize the tops to fit whatever party theme that suits your fancy . And thanks to Amanda over at It's Always a Party at the Parkers, we have this nifty little tutorial to make it all so very easy for you . . . 1.) Melt your chocolate candy coating in the microwave. 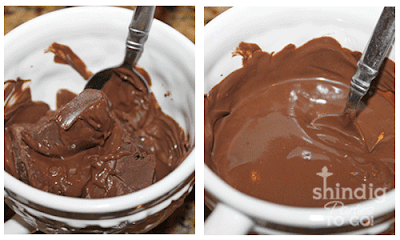 Put a few squares of chocolate in a glass or ceramic bowl and place in the microwave on 50% power for about 1 minute. Take out, stir and put back in at 50% power for 15 seconds. Keep repeating until the chocolate is melted but be sure not to overheat - it will burn the chocolate and that is a definite no-no. We must not burn the chocolate! Never, ever waste chocolate. Ever. 2.) Spoon some melted chocolate into your Oreo mold about a third of the way full. Place a Double Stuff Oreo cookie into the chocolate and press down until the top of the cookie is level and just a bit lower that the top of the mold. 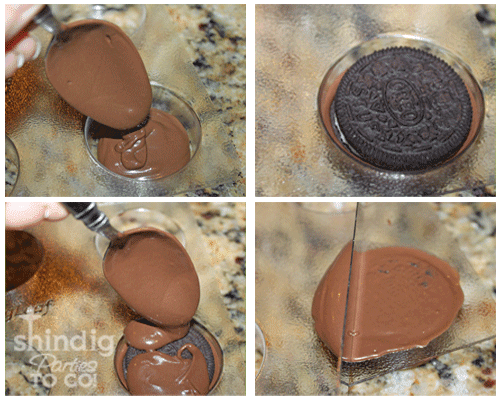 Spoon more chocolate over the cookie until it is covered with chocolate. 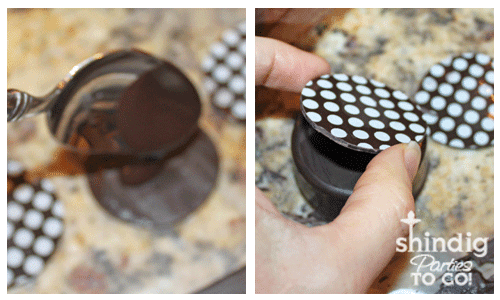 Tap the mold against your countertop to make sure all air bubbles are removed and that the chocolate has gotten down on the sides of the cookie. Next, take a offset spatula or some other flat and straight tool like the back of a large knife and scrape across to level the chocolate out. 3.) 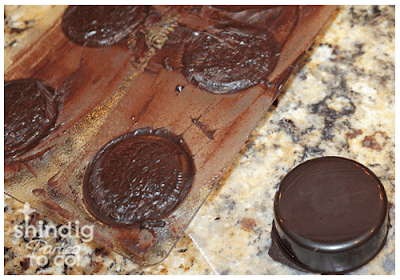 After filling each of the cookie mold cavities with an Oreo and chocolate and scraping across the top to level off each cookie, place the mold in the refrigerator for about 10 minutes or until the chocolate has firmed up. 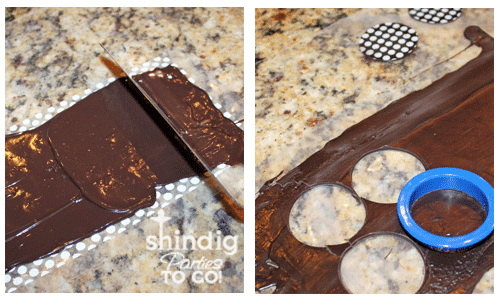 Turn the mold over and pop out each chocolate covered cookie. You'll be amazed how perfectly formed they are and how easy it was to make them. 5.) Take your chocolate transfer sheet and cut off only the portion that you will be needing. My mold had 6 cavities so I cut a piece wide enough to cut out six circles that would fit on top of the chocolate covered Oreo cookie. 6.) 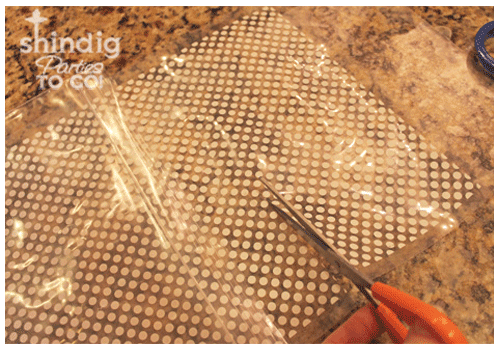 Place the transfer sheet on top of piece of wax paper (I sprayed the bottom side of the wax paper with Pam cooking spray so that it wouldn't shift around the countertop). 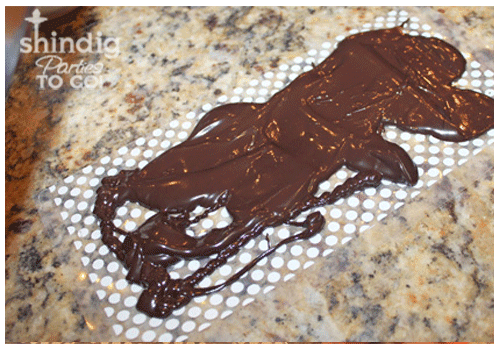 Next, pour out some of your melted chocolate on top of the chocolate transfer sheet. 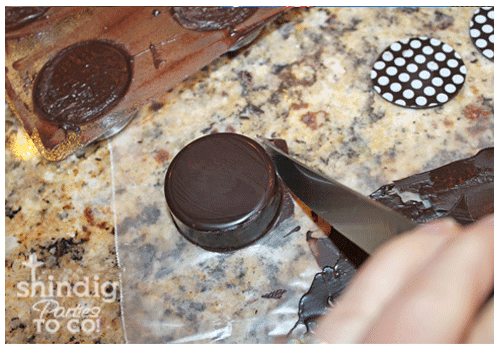 Allow the chocolate to set for 5 to 7 minutes or until it's no longer glossy but not completely firm and brittle. At this point, you can cut circles of the chocolate patterns to fit on top of your chocolate covered Oreos. Use a circle cookie cutter just a little smaller than the diameter of your Oreo and press into the thin layer of firmed chocolate. Press and turn the cookie cutter until you have punched out a circle of the chocolate transfer sheet. 8.) Put a small dab of melted chocolate on the back side of your patterned chocolate and apply the circle to the top of your chocolate covered Oreo. 9.) Repeat the whole process until you've made a plate full of beautiful cookies. It's really that easy! 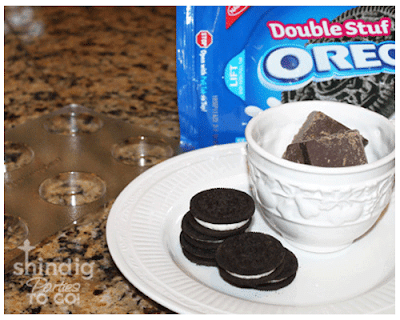 I definitely recommend buying more than one Oreo cookie mold. Most come with 6 cavities and it would have been much quicker and more efficient to have 12. But all in all, the results are fascinating and with all of the choices of chocolate transfers, it's truly something you could make for all kinds of parties. Thank you, Amanda! Have a wonderful weekend everyone! 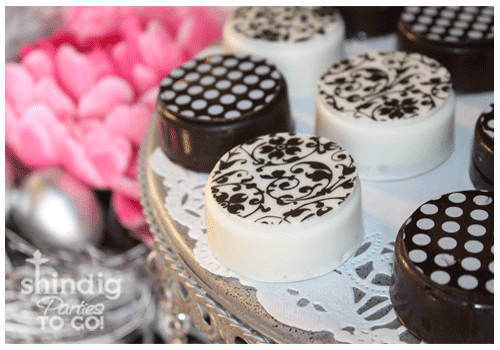 You have inspired me to create these lovely delectables for my candy buffets. Thanks for the tutorial! I have always wondered how these were done and I couldn't find out any information on them. THANKS SO MUCH for sharing this tuturial.